The Oliver Twins will be well-know to any British gamer who grew up during the Spectrum era, but the duo also produced games for the NES. Dizzy remains by far their most famous creation, and a lost NES title will be hitting the market early next year thanks to a successful Kickstarter campaign. Mystery World Dizzy, as we've already reported, is a "lost" game that never saw the light of day back in the '90s. The Olivers have already released the game online for free (alongside Wonderland Dizzy) but a campaign was recently launched to produce physical cartridges, complete with packaging. The goal was a modest £12,500, and at the time of writing (and with 29 days remaining) it has already raised £12,727 (and counting). It's a positive start to the campaign, and stands in stark contrast to the Olivers' 2012 attempt to crowdfund Dizzy Returns, an entirely new entry in the franchise. It should be noted that the funds from this campaign will be used solely to produce 500 physical copies of Mystery World Dizzy - the Olivers are donating their share of the proceeds to the charity Special Effect. I loved Dizzy on my C64!! I had a large red box and large blue box with numerous Dizzy games on each. Ah, the memories. Thanks for the heads up! Didn’t own an NES growing up, so this will be my first new-in-box game for the NES. Wow, that is a very impressive looking NES game, especially with the all the effects an no slowdown. I'm going to try it out online. I hope we can get a brand new Dizzy game, just a small one, these guys seem really passionate about the series. Dizzy belongs on the ZX Spectrum exclusively. Fact. Hopefully it'll be possible to play this on the Mini NES. LOVE Dizzy and the Oliver Twins. And the Codemasters games for the NES and Master System were often technical marvels. 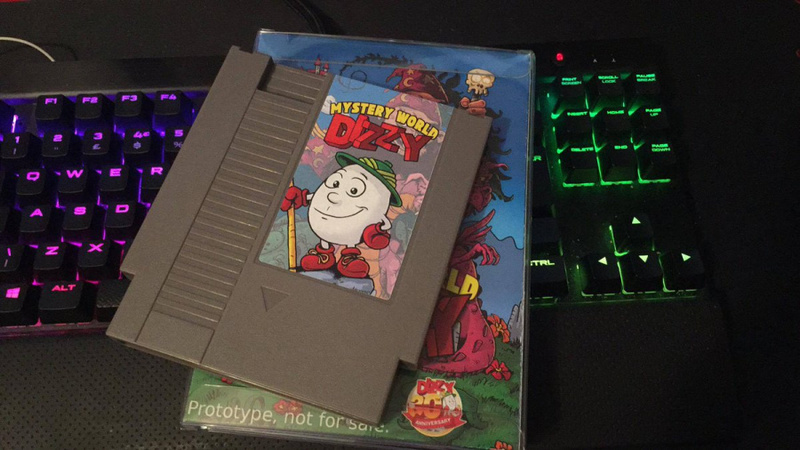 @Pazuzu666 I definitely agree with this, but for as long as the Codies have Dizzy (and his Speccy adventures) locked in their vault I can't deny the appeal of these "lost" Oliver Twins games. I want it. I love this. Dizzy for life. I don't understand why you would limit yourself to only 500 copies though. It just seems like bad business to not at least gauge the interest first before deciding a production number. Very cool! I grew up in the NES era and it’s present day sirene call of unreleased games via Kickstarter is something I can’t pass up. I’m not familiar with Dizzy, but the game footage and brief video sold me on the quality of the game. Looking forward to checking it out.